By enthusiastically seeking out and introducing cutting-edge analyzing and measuring instruments, we further evolve Hidaka’s core technologies in order to meet the required performance and quality. We have various analytic devices and keep doing research further: our tensile testers are used to analyze physical characteristics of materials, high-speed cameras are used for dynamic analysis, 3D modeling provides structural analysis, and mechanical analysis can be done by simulation technologies. With our accumulated data, we are jointly studying with university research institutes. 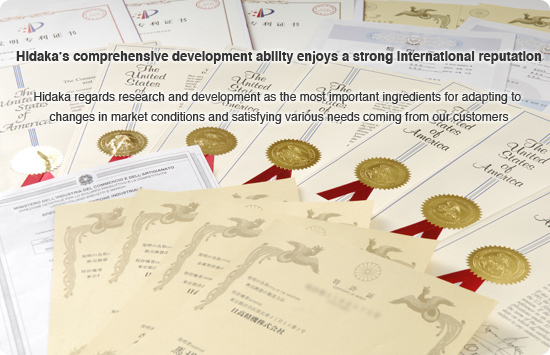 The unique technologies nurtured through our research and development have achieved global recognition and have been granted many patents both in Japan and overseas. And based on Hidaka’s unique plastic working technology, we are aggressively engaged in R & D relating to technologies and products across many fields.